If you start to question whether has the Motormouth suffered from the wrath and succumbed as a consequence of manic bingeing throughout these 4 years (the blog’s anniversary is just right on the horizon! ), the answer may be YES. But not from the sheer overload of food. Almost an overkill, actually. Honey Sea Coconut with Lemon, Sambal Belacan and a tangy, piquant sauce made up of chopped chillies and a squeeze of lime, and the omnipresent (on every table!) fried chicken wings. I know. Every now and then you’d be treated to relentless episodes of ramblings. Maybe I just need a channel to voice the frustration of catching up with the flow of time. Or I could be catching my breath; in this tormenting race and ordeal. Skipping all the food and travel shots for a day (yeah, bits and pieces of KK and JB to come over the impending weeks), this dinner at Kwai Lam Seafood Restaurant in Kampung Subang took place very, VERY recently. In fact, barely two hours ago after touching down at Subang airport (gotta love Firefly …. hassle-free check-in at 10 minutes before departure, and the airport’s 15 minutes away from home!). 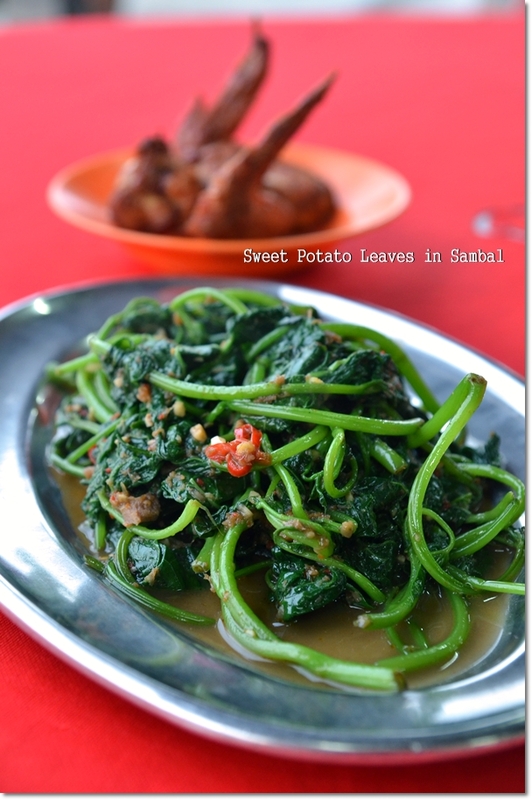 Now, I have not stepped foot on the soils of Kampung Subang, let alone tried any of the food there. Seemingly, this area is packed with seafood restaurants (although Subang and seafood don’t really gel together ….. unless there’s a shore somewhere that I am not aware of), and reminded me of good old Sitiawan with the whole stretch lined up with seafood restaurants serving almost the same dishes, but paired with coconut wine (toddy)! Kwai Lam Seafood Restaurant came up in the GPS, and from a rapid Google search. 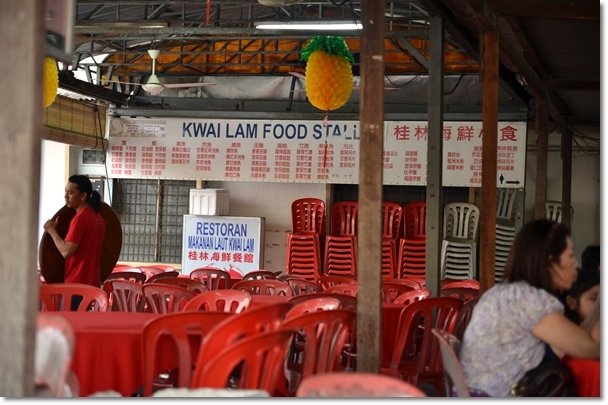 And so, we went to a place almost resembling any of the seafood restaurants in Sitiawan, or even Teluk Gong in Klang. Plentiful of tables covered with red table cloths and a roof made of zinc with plentiful of ventilation. Plus, pesky (yet adorable, I’d say) dogs and cats roaming around your feet. 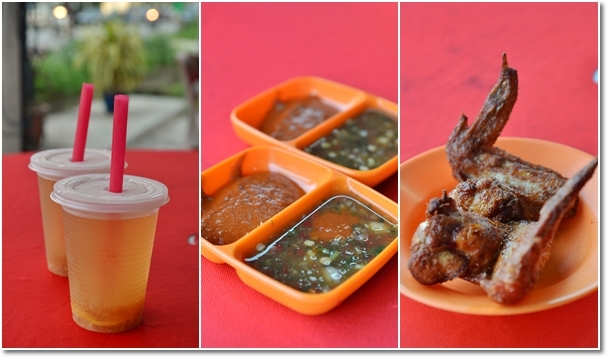 The dishes came in succession, with the fried chicken wings (RM2.30 each) arriving first in a glistening hot manner; greasy and torching the unsuspecting lips. Pretty good, though I wouldn’t say these were the best wings out there. A good appetizer, nonetheless. Something to tamper the gastric juice especially when the place is packed to the brim; as was the case after 7pm today. 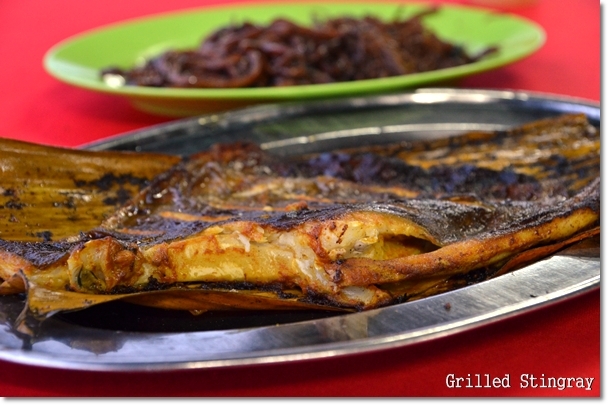 The grilled stingray came after about 20 minutes or so, (RM16.00), a dainty portion with half a side packed with flesh with the other slightly burned from the grill. Sweet, fresh and went well with the spicy condiment. Somehow, I was still hoping for a tastier fish. We gave the crabs a miss, since the previous ‘lunch’ at about 3.30pm at JPO (Johor Premium Outlets) was still giving me the yawns and limiting the appetite centre in the brain to crave for anything. The noodles meanwhile, was a disaster. Skip the Hokkien mee or mee hoon, if you would. Aside from the bits of lard fritters, the noodles was dry, bland, and completely out of tune. Should have opted for fried mee hoon with lala or something. Maybe I was just fatigued from the hours of travelling. 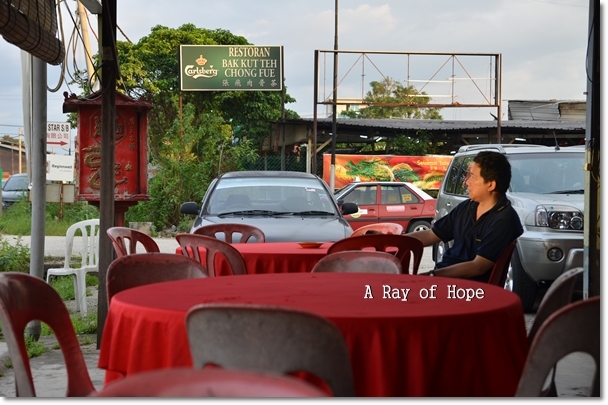 Or I could be putting my hopes too high up on seafood here in Subang …. Now I crave for some fresh, meaty crabs, prawns and lala (clams) from Sitiawan, Tanjung Tualang or better yet … Sabah ……! Opens for dinner only, from 6pm onwards until late night. I remember this place 20 years ago they famous Hokkien mee, fried lala & craps. On the other side same road there is a place called Choong Foong restaurant pretty good, now catering mostly wedding dinner. I see… I noticed that there are quite a number of similar restaurants around the area too. First time venturing to this neighbourhood, actually. d hokkien mee + noodles looks good..
Looks yes, but I still prefer mine laden with ‘chu yau char’ (lard fritters) that are crispy, and the noodles to be moist instead of dry.